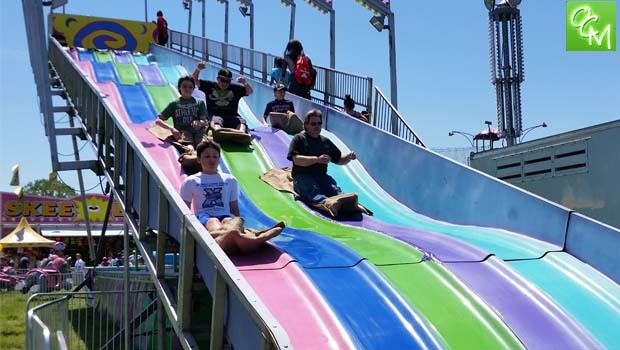 Rochester Hills Carnival 2019 – 42st Annual Leader Dogs Spring Carnival info. The 2019 Rochester Hills Carnival will be held at Hampton Village Center (The Target / Best Buy) parking lot on NE Corner of Rochester Rd and Auburn Rd. This carnival had previously occupied the old KMart parking lot on Rochester Rd and Avon Rd. The Rochester Hills Leader Dogs Spring Carnival will take place for 2019 from Thursday, June 6 through Sunday, June 9, 2019. The Leader Dogs Spring Carnival serves as a fundraiser for the Rochester Hills Lions Club as well as a benefit for the Leader Dogs for the Blind non profit in Rochester and is a Rochester / Rochester Hills springtime tradition! This carnival features carnival midway rides from North American Midway Shows, games, food and family fun. Buy individual ride and food tickets or purchase one-price all-day wrist bands. Again this year, there will be the very special LED lit “Eye in the Sky” giant Ferris wheel, and specialty rides like the Freak Out and the Himalya. Proceeds from the spring carnival benefit the Leader Dog School for the Blind and local Lions Club charities. For more info on The Rochester Lions Club Rochester Hills Carnival 2019 to benefit The Leader Dogs for the Blind, visit www.rochesterlionsclub.org. How much are wristbands/ticket prices? ?